Rancher husband shakes his head “No” to both. So I wake up and there has appeared magically a rope across the yard and our three horses are now munching the grass. Trouble is that in that week’s time when the grass grew, the weeds grew faster. Finicky horses don’t like the weeds so the result is not exactly the well manicured suburban lawn or even that tidy of tidy ranch wives’ lawn on “The Pioneer Woman”. Now I am not a neat freak, but the backyard looks like crap, literally. The grass is chewed down well enough, but besides the tall weeds there is a whole lot of horse poop. So this is not a lawn you’d want to roll around in with your dog let alone have a lawn party. My whole “Out of Africa” kind of vibe I had going is shot. (Yes, I see myself more like Meryl Streep than Ree Drummond. And I’m more inspired by Martha Stewart and Bobby Flay than the local church cookbook. I’m looking forward to Rancher husband’s (should I call him Bud Lite Guy like Pioneer Woman’s Marlboro Man?”) next idea. This entry was posted in Montana Life, The Cowgirl and the Contadina and tagged lawns, Montana, summer. Bookmark the permalink. Very pricey. We used to have a dealer and a repair shop, but not anymore. A lot of shops have closed. We used to have two car dealerships and now we have none. Used to have two grocery stores and now just one. Two hardware stores and now one. Am waiting to hear if we are taking it to Billings or trying to find a local repair guy. My next essay on charitable summer picnics is almost ready. Needs one more look over. Won’t be having any fundraisers on my lawn anytime soon. Depends on what’s wrong with it. You wrote that it blew up – does that mean the engine seized? If so, that’s an expensive proposition to fix, but depending on the age of the tractor, not as expensive as buying a new one. I had an old Dixon zero turn (close to 20 years old) and finally junked it. I got a “new” Dixon with a new short block for $1800. I can mow in 45 minutes what used to take me 1.5 hours. 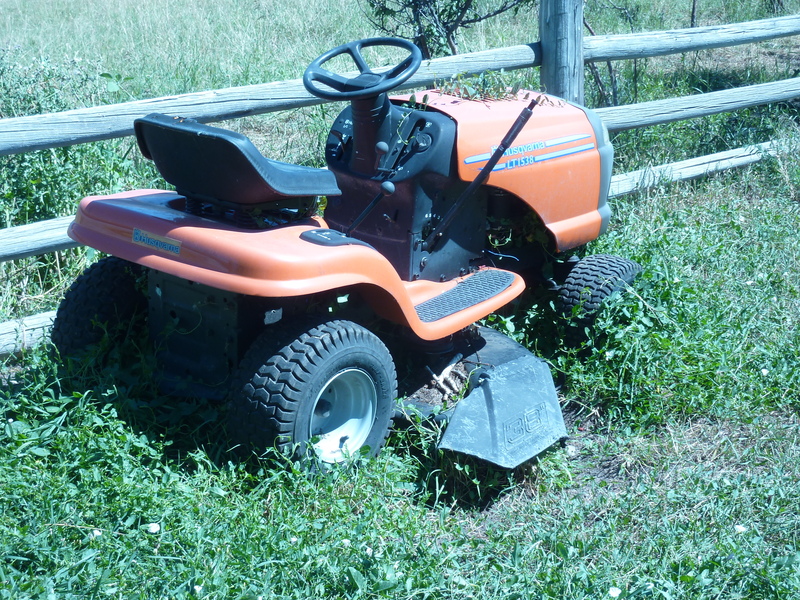 When our lawn tractor broke down, it started to cost more to keep repairing it than to just hire someone to do the lawn. It was the best decision we ever made. We still need to sell the old tractor and were just talking about it at dinner. The plan, as of now, is to not water the lawn anymore. We actually do that anyway at the end of summer. Yeh, it’s a lot of brown but I don’t feel guilty about using water for some lawn I don’t use. I would eventually like to replace grass with paths and some native grass. This winter ranch guy will repair the engine himself. Perhaps I will assist and learn to repair something. 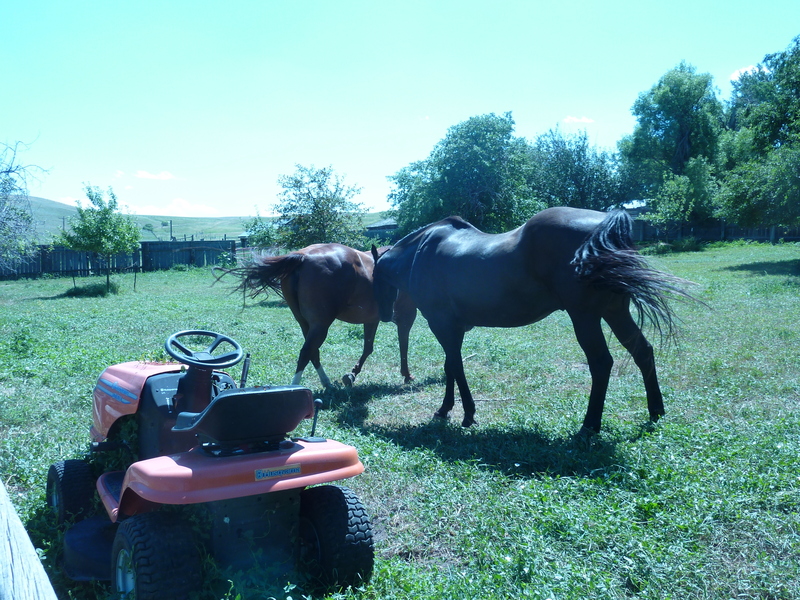 Today I will take the push mower and cut the grass around the house; the area we corded off from the horses. Oh, yes, I will also be getting out the snow shovel to remove the horse turds. Good exercise.